Earlier this week I reviewed Orphans & Ashes, a tile-based game, for 2-players, from Blind Ferret Entertainment. It is based in the world of Looking For Group, the great webcomic by Ryan Sohmer and Lar deSouza. Looking For Group is a comic based in a fantasy world. At the heart of its cast of characters are Cale’anon, a good-hearted elven hunter, and Richard, an evil undead warlock. The two characters act as literary foils for each other and are about as morally opposite as you can get. While that black or white morality is the driving them to Orphans & Ashes, the More Phun Expansion adds in some colour. Specifically green and purple. Except Benny’s pawn is actually pink not green like her skin (presumably because green will be used for a different character in a future expansion. We can hope, right?) As well there is some controversy whether Sooba is purple or blue, and if she’s blue, is it blue blue or that silver age comic thing where blue is actually supposed to be black? But her pawn is purple, so I guess it adds pink and purple not green and purple, but not just black and white. Although if we are using pawn colours Cale and Richard were already blue and red, so I don’t know whats going on anymore. MORALITY! Right, we were talking morality. The original characters are very specific in their moral views, the new characters aren’t as specific. Sooba is Cale’s chaotic panther companion. She is notoriously unpredictable and just as likely to pounce her friends as she is to attack their enemies. She is also just as likely to go maul innocents with Richard and she is to save them with Cale. When you play Sooba as an individual character in the game her goal isn’t initially clear. Before the game begins the player rolls a die to determine if Sooba will get a point for every orphan she saves or every orphan she kills. I like to add a bit more uncertainty by keeping the die hidden from the other player(s) until it becomes obvious which goal was rolled. Benn’joon, or Benny for short, is a priestess with divine powers. Her bloodline is eventually revealed in the comics, but I like Richard’s early description of a “female of unknown pedigree.” When playing her as an individual character, her goal is ultimately to save orphans for points, but not in the same way as Cale or Sooba. I’ll come back to her abilities in a moment. Besides just adding new characters to your 2-player game, the More Phun Expansion also adds rules variants to play with three or four players. Head to Head play, is basically the same just with more heads. Splitting the Party is a 2v2 team variant. The last variant is the fully cooperative version, Not Alone! All the variants adjust the way setup and Fire phases work with more players, and several also makes adjustments to the character’s goals and abilities. Like the original, everything is well made and well thought out, except Benny. I’m not sure if I just missed something or if the person doing the final editing of her rules did. For example, her special ability “Faithful Leader” mentions using “Blind Faith” on an orphan, but I can’t find anything about “Blind Faith” anywhere else. We basically just house ruled it to be synonymous with using her “Ward” ability. 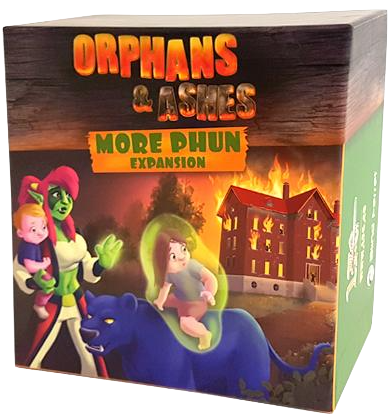 Orphan’s & Ashes: More Phun Expansion adds some great new elements to an already great game, without drastically changing the way the original goes. If you’re going to pick up the original, this is worth picking up as well. Until then, you can find all the things from Blind Ferret Entertainment online at shop.blindferret.com and on their Facebook page facebook.com/BlindFerretENT. I also want to toss out a link to LFG artist Lar deSouza’s Spoonflower page ( www.spoonflower.com/profiles/lartist ) because everyone needs a shirt made from his tiki prints.